Wind blows breezily at Agam regency. Cold air touch your skin softly and you can feel the beautiful scenery when the great mountain outspread in this regency so charming. As a territory which placed at strategic position in west Sumatra, this province has many potential culture and natural scenery. The culture is so unique and very interesting, the people of Agam also very friendly. Agam’s handicraft and some traditional hand work also can be found here, weaving embroidery, embroidered goods, blacksmith, gold and silver craft are very pretty and those were heredity occupation. You can get public transportation easily to go to those tourists area. 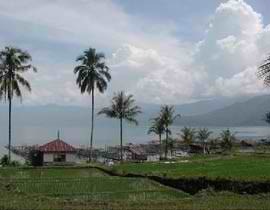 During the journey, you can see the natural condition of west Sumatra, mountain, hills, valley, plateau, lake and beach. They were so beautiful. At this moment, the most favorite tourist area that most domestic tourists and foreign tourist visit is the Top of Lawang. It was ± 1,210 m above the sea level. At the Netherland colonial era, Top of Lawang has been used as asylum for Netherland noble. From here, you can see the Maninjau Lake and Indonesian ocean. And because of its location so high and its scenery so beautiful, now Top of Lawang developed as location for Take Off Sky sport (Paragliding). Flying outsoar until approach the land at Bayur, the edge of Maninjau lake, we can see the beauty of Maninjau lake. And for you who love challenge and cross country, you can walk go down along the slope of mountain to the Maninjau lake or cross the protected forest to the Wisata Embun or go back to hotel. And your journey will be uncomplete if you’re not trying the Terbang Tandem using the parachute with trained local flyer. Not far from Top of Lawang, you can also enjoy the beauty scenery of Embun Pagi(morning haze). Here, agree with its name, the atmosphere always feels like in the morning, cool and relaxing. Embun Pagi tourist area placed not far from Maninjau lake and it was at ± 1,000 M above the sea level. From Embun pagi, if you go down to the Maninjau Lake using private vehicle or pulic transportation, then you’ll passed Kelok Ampek Puluah Ampek area. You’ll find many souvenir such as hat made from pandanus braid, kampia bag, necklace, bone bracelet and many dills. 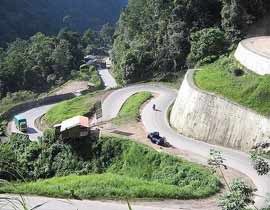 This region was named Kelok Ampek Puluah Ampek, in English means “44 blind turning”, because along the journey to the Maninjau Lake, we’ll pass blind turning as many as 44 times. The moment you arrive at down of the mountain, you’ll find three branch. If you turn left, you can go to Buya Hamka’s birth place at the Batang river, Muaro Pauh village. At that simple house, in 1908 Hamka was born. Now this place become a museum. If you turn right, you can go to Lubuk Basung, the Agam’s capital regency. The last tourist object is pond, well it’s not an ordinary pond, this pond has three taste, sweet, sour and bitter. This place was well known as Air Tigo Raso (three taste water). This water which placed at Malintang city, believed by local people has magic power. People believe this water can cure many diseases especially skin disease. And this water believed can make you ageless . Well, let’s try it.